It’s Thanksgiving week in the United States and it is truly a time when American’s reflect on all that is good in life. It is a time when helping others is in the forefront as charities like The Salvation Army, US Marine Toys For Tots, and many others are working to make the holidays joyful for those less fortunate. And golf courses around the country also do their part to help. I want to share just one example to highlight giving activities at local golf courses. 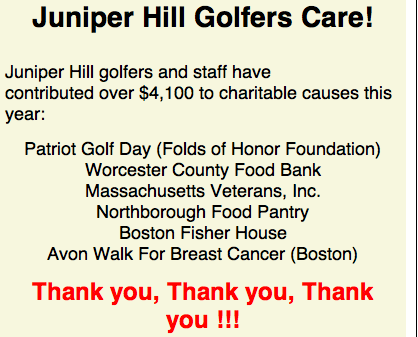 I received an email from a Massachusetts golf course, Juniper Hills sharing the results of their “Turkey Day” event. 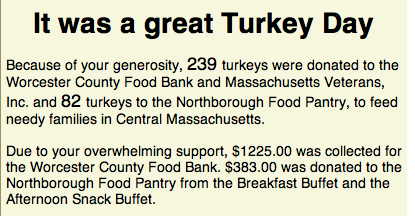 But Turkey Day is not the only activity at Juniper Hill that raises money. They also support the national event, Patriot Golf Day, held Labor Day weekend. Golfers add a dollar to their green fee and the donations are given to the Folds of Honor Foundation supporting veterans and their families. For me, the saying “Charity begins at home” rings true for local golf courses. So congratulations to Juniper Hills Golf Course, as well as all local golf courses and golfers making a different this holiday season (and throughout the whole year). One of the things that makes me proud to be a fan of golf is that so many golfers support a variety of causes and give back to many great charities. Many of the professional golfers have started charitable organizations. 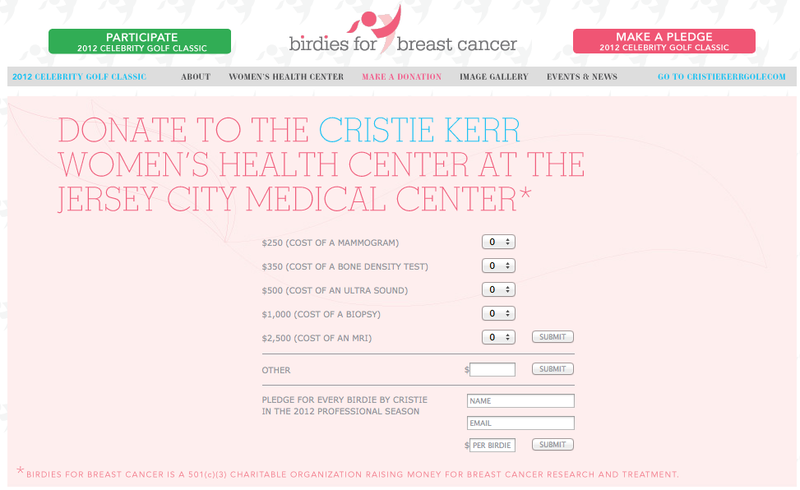 This post is about Birdies for Breast Cancer, a charity of golfer Cristie Kerr. 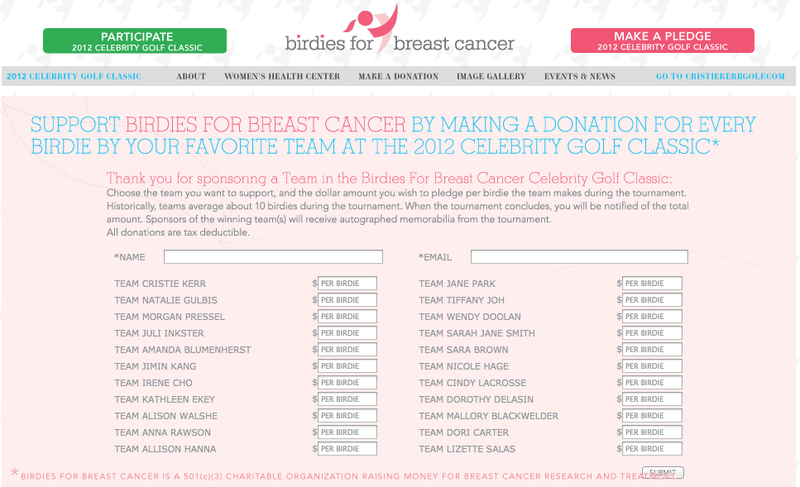 On October 1, 2012 the fund-raising event “Birdies for Breast Cancer Celebrity Golf Classic” takes place at Liberty National Golf Course. If you want to donate to the charity you have a few options. You can go to the Donation page (image below) which has a number of options. I like the fact that it tells you the value of a donation. Or you can put some “skin in the game” and have fun by making a pledge to your favorite player (and their team) participating in the golf event. It is easy to do on the Make a Pledge Page of the website (image below). On a personal note, my mother had breast cancer and was cancer free for five years but then got a different women’s cancer and left us too soon. I’ve always been a fan of Cristie Kerr and it’s nice to see that she supports women’s health. DISCLAIMER: I have no association with the charity or Cristie Kerr. This is just my view of golf and charity! What Does the Natalie Gulbis Swimsuit Photo have to do with Charity? The Bleacher Report is “the US’s 4th largest sports media site with 25+ million monthly readers,” and they reported that the release of the Sports Illustrated swimsuit photo of Natalie Gulbis was timed perfectly for a charity that is auctioning a chance to caddy for Gulbis in an upcoming LPGA event. So I went to the site for the charity and to my surprise it is not some big foundation but an Episcopal School in Charlotte, North Carolina. Not only do they have Natalie Gulbis but they also have the chance to be a caddy for David Love III as an auction item. You can bid on them or “pay now” for one of them for $8,000. What a windfall from a PR perspective for the Charity. Now, you might think it makes sense that Davis Love is listed because he lives in Charlotte and went to the University of North Carolina (in Charlotte) but how did they get Gulbis? She did not go to school in North Carolina and she lives in Arizona. I was hoping it was just plain luck on the part of the charity but my curiosity got the best of me and I wanted see if I could find the connection. Well according to another article I found at Golf Channel, “A parent who works in sports marketing for consulting firm McGladrey helped secure the caddy spots.” And, surprise, surprise, both golfers are clients of McGladrey. Also according to the Golf Channel Article, the head of the school said they did not know that the SI swimsuit edition was coming out. Really? The parent who works for McGladrey surely knew when their client’s swimsuit press would be released. I guess the only other outstanding question is will someone pay $8,000 to spend 4 or 5 hours to caddy for Gulbis? We will most likely find out after February 25 (the night of the charity event) — I’m sure the folks at McGladrey are already working on the press release. This week I want to highlight another interesting charity that is tied to the performance of the golfers during a tournament, Eagles for Education. Chevron has continued this charitable program in 2012 and this week at the AT&T Pebble Beach ProAm, 46 eagles were recorded. The donation amount per eagle was not as significant as it was at Chevron’s event last December but it still generated a great deal of money. The per eagle donation was $8,000 for a total of $184,000. The next stop on the tour is the Northern Trust Open and according to their website Chevron is bringing Eagles for Education to the Northern Trust Open and donating $2,500 for every eagle recorded during the tournament. The other interesting event that Chevron ties to their participation at the tournaments is a STEM (science, technology, engineering and mathematics) Zone to educate youth. 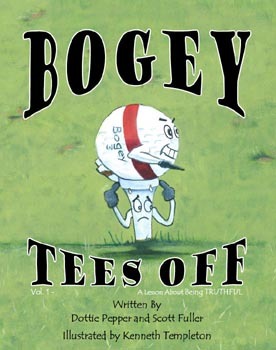 At the tournament they will have a demonstration on some type of science or technology based on golf to make it fun. For example, the flight of a golf ball which is demonstrated in this Chevron World Challenge video. If you want to see a more in-depth discussion of the program watch the Golf Channel’s Video on the Chevron STEM Program. The sponsor for the Phoenix Open is the Waste Management company. Most of us know them because we see the logo on the garbage truck that picks up our trash. They are taking their logo and making it part of a unique donation to the The First Tee — a non-profit organization that uses golf to educate youth and promote life-values like integrity and respect. Waste Management has taken its logo (the WM) and made a 120 foot high, eight-ton logo floating in the lake on the 18th hole. It is made up of 140,000 recycled golf balls collected from water hazards on golf courses. If that is not unique enough for you, the golf balls will be donated to The First Tee of Arizona to be used in their golf programs. This is just one of many recycling initiatives implemented by Waste Management at the Phoenix Open. Below is a video highlighting the Zero Waste Challenge. Watch the video and at the one minute mark you will see the floating logo.